Welcome to the Makers of Metroid, the section of this Magazine dedicated only to the brilliant and creative minds behind the series of Metroid. For the first issue we have decided to go with the runner-up, in order of relevance, of the long list of people behind this series, Yoshio Sakamoto. Yoshio Sakamoto was born in Japan, but due to scarce information on his life previous to his employment in Nintendo the exact location and date are unknown. His life as a kid is also a mystery with only vague details know mostly as anecdotes. For instance, Sakamoto once stated very briefly that he grew up with Nintendo toys, which he considered to be occasionally “strange.” Extensive biographical studies and interviews with him have yet to be made to have full access to his childhood life, but for the time being, we’ll simply head unto his work. Shigeru Miyamoto noted his extraordinary creative abilities, hiring him for the Nintendo Research and Development 1 (Nintendo R&D1), led by Gunpei Yokoi from its creation. He enters the designing team right as the famous arcade game Donkey Kong Jr. was being developed, having the priviledge of helping in its production. After this game, he moved on to the design and development of Kid Icarus, and earns his place in history by directing the first Metroid game, both of these in 1986. Following these successes, in the early 90s Sakamoto created a private section of R&D1, possibly considered as a club, by the name of Team Shikamaru, which had the role and great responsibility of the scriptwriting behind all the games that the developing team would then make a reality. 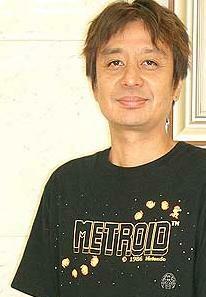 Sakamoto left the sequel of Metroid, Metroid II: Return of Samus to Hiroji Kijotake, in 1991. Nevertheless, he later returned to direct the production of the highly acclaimed Super Metroid (Metroid 3) in 1994, continuing on with Metroid Fusion (Metroid 4) in 2001, and Metroid: Zero Mission (Metroid 1’s extended remake) in 2004. He also supervised the production of Retro Studio’s Metroid Prime (2002), Metroid Prime 2: [Dark] Echoes (2004), and Metroid Prime 3: Corruption (2007). His design work is also found in other games of which the most prominent is the Wario series, being one of its creative minds and main designers. Since the company restructuring of 2004, the Nintendo Software Planning and Development (Nintendo SPD) was founded, where Sakamoto has been the director and producer of the SPD Production Group 1 and is working in Card Hero DS along with Intelligent Systems. In 2004, Nintendo Entertainment Analysis and Development (Nintendo EAD) was founded as well (primarily by Nintendo R&D4), merging Teams 1 and 2, taking Sakamoto along as well. The following is a list of all the games Mr. Sakamoto has worked on. • Super Smash Bros.: Brawl (2008), Nintendo Co., Ltd.
• Metroid Prime 3: Corruption (2007), Nintendo of America Inc.
• Picross DS (2007), Nintendo Co., Ltd.
• Rhythm Tengoku (2006), Nintendo Co., Ltd.
• WarioWare: Smooth Moves (2006), Nintendo Co., Ltd.
• Metroid Prime 2: Echoes (2004), Nintendo of America Inc.
• Metroid: Zero Mission (2004), Nintendo of America Inc.
• WarioWare Touched! (2004), Nintendo Co., Ltd.
• WarioWare, Inc.: Mega Party Game$ (2003), Nintendo Co., Ltd.
• Balloon Fight (2002), Nintendo of America Inc.
• Metroid Fusion (2002), Nintendo of America Inc.
• Metroid Prime (2002), Nintendo of America Inc.
• Super Smash Bros.: Melee (2001), Nintendo Co., Ltd.
• Wario Land 4 (2001), Nintendo Co., Ltd.
• Famicom Tantei Kurabu Part II: Ushiro ni Tatsu Shoujo (1998), Nintendo Co., Ltd.
• Game & Watch Gallery (1997), Nintendo Co., Ltd.
• Galactic Pinball (1995), Nintendo Co., Ltd.
• Teleroboxer (1995), Nintendo Co., Ltd.
• Kaeru no tame ni Kane wa Naru (1992), Nintendo Co., Ltd.
• Balloon Kid (1990), Nintendo of America Inc.
• Kid Icarus (1986), Nintendo Co., Ltd.